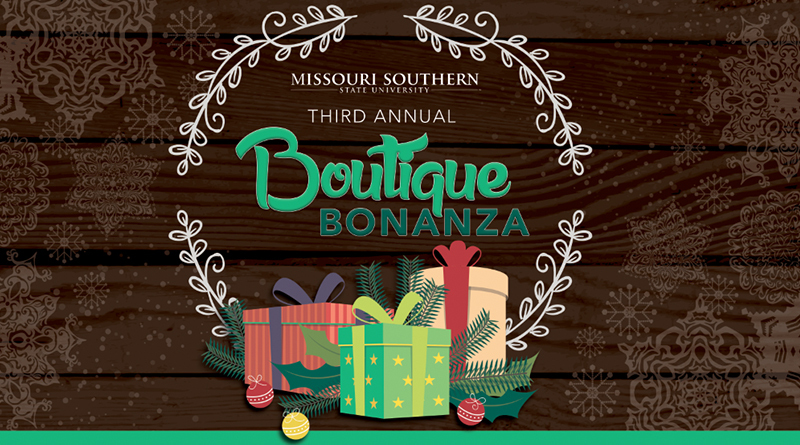 The Missouri Southern Alumni Association will present the Boutique Bonanza from 10 a.m. to 3 p.m. Tuesday, Nov. 29, in the Ralph L. Gray Alumni Center. The festive shopping experience will feature local merchants offering a wide variety of holiday gifts. Vendors will include B. Hayes Designs, Colonial House, Her Saving Grace, Madison Lane Interiors, Pink Rose Gift Shop, Repurpose Boutique, Sophie, The Artist’s Loft and Walnut Springs Art Barn. Anyone who visits will be entered to win either a Michael Kors purse or watch (valued at $300); gift certificates to Instant Karma and Eagle Drive-In; and a $50 gift card to the MSSU Bookstore. Everyone will also receive a 20-percent off coupon to the MSSU Bookstore as well as free cookies and hot chocolate. The event is open to alumni, faculty and staff, students and the community.